Does anyone else know that awkward moment when you’re on a date and the server brings the food to the table assuming that the big juicy steak belongs to the dude? Yeah, I’m familiar with that moment because I LOVE a good steak and Joel is all about a burger. I love it seared to perfection with just the right amount of pink in the middle, topped with butter or maybe some crumbly cheese. MMMMMmmm. 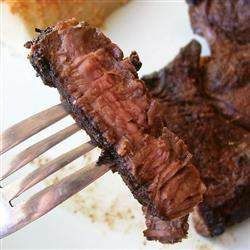 I’m a vegan’s worst nightmare, but rarely do I ever make steak at home…that is, until I found this recipe. Everyone’s taste buds concurred and I bet yours will too. I don’t have a grill so I don’t do steaks but this might make me try it on the stove in a grill pan. YUM!